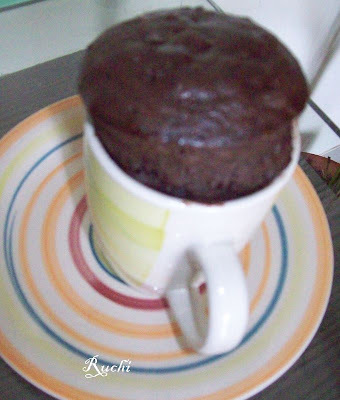 While surfing the internet I found this cool recipe from this site with some pictureshttp://www.dizzy-dee.com/recipe/chocolate-cake-in-5-minutes. For those chocolate-craving days, this super-easy chocolate cake recipe is all you need. And yes, seriously This cake in a coffee mug that cooks in the micro in just 5 minutes. This recipe looked pretty interesting. I made some changes in this recipe I didn’t use egg then instead of oil I used unsalted butter. It turns out good. My kids loved it! Mix flour, sugar and cocoa to mug, and mix well. Add the egg and mix thoroughly. Pour in the milk and butter and mix well. 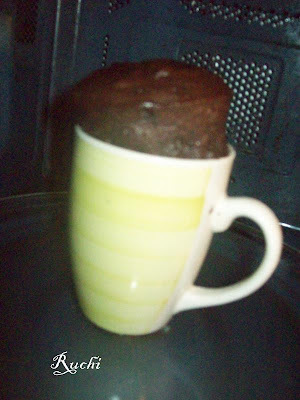 The cake will rise over the top of the mug,. Allow to cool a little, and tip out onto a plate and enjoy! looks really yummy & quick..
Beautiful, such a yummy treat for kids. Thanks Jaya. Awesome and quick chocolate cake. I am going to try this one now. You have not written egg in ingredients list!! Hello friends Nice to know u all liked it!Thank u all. @ Nivdita i send u mess In FB. I baked the cake just now with little changes. It came out fantastic!!! Thanks to you and the link you have given. Will post the photos tomorrow.